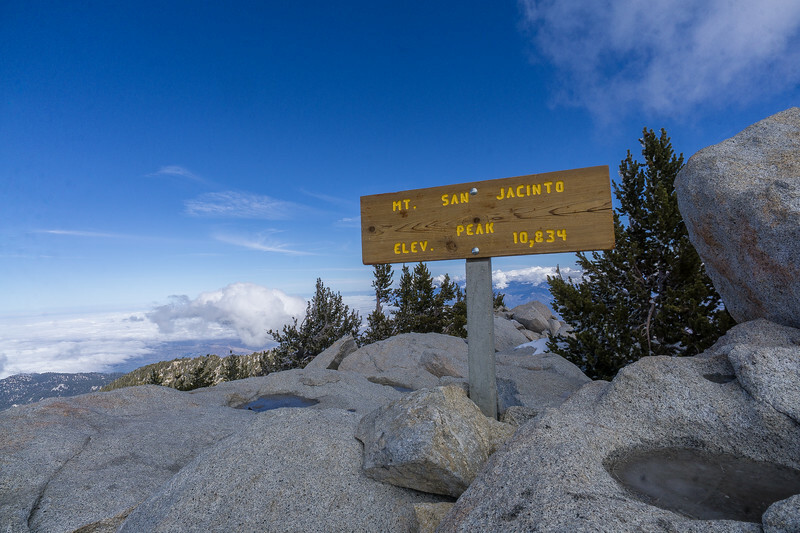 San Jacinto peak, in southern California, stands at an awesome 10,834ft. 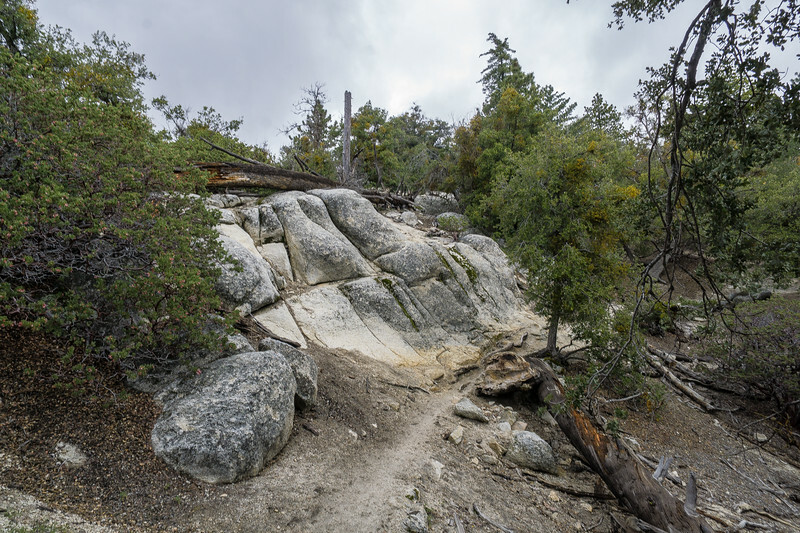 I used this hike to shake out my gear for my High Sierra Trail to Mt Whitney Hike . After doing a little research, I planned this hike following these two awesome guides from SoCal Hiker and ModernHiker. 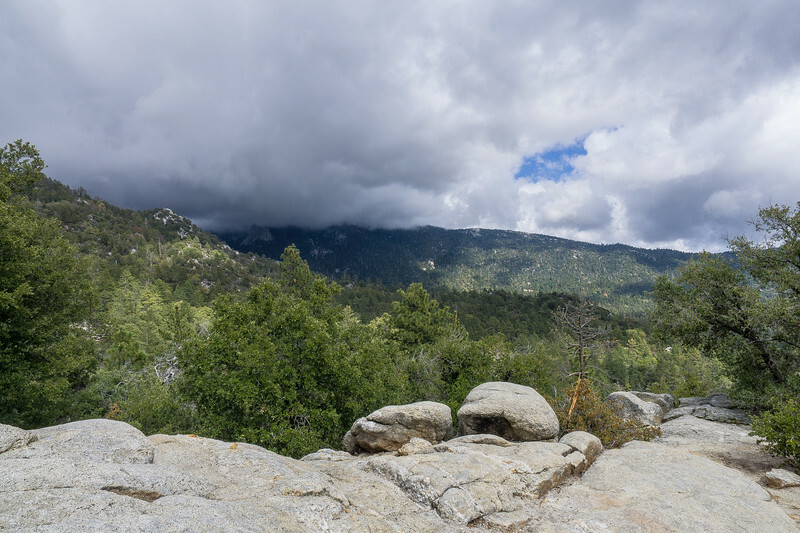 I had to tweak the hike a little because I planned on hiking with all my gear that I plan to take to Mt Whitney and would be starting out pretty late on Saturday. 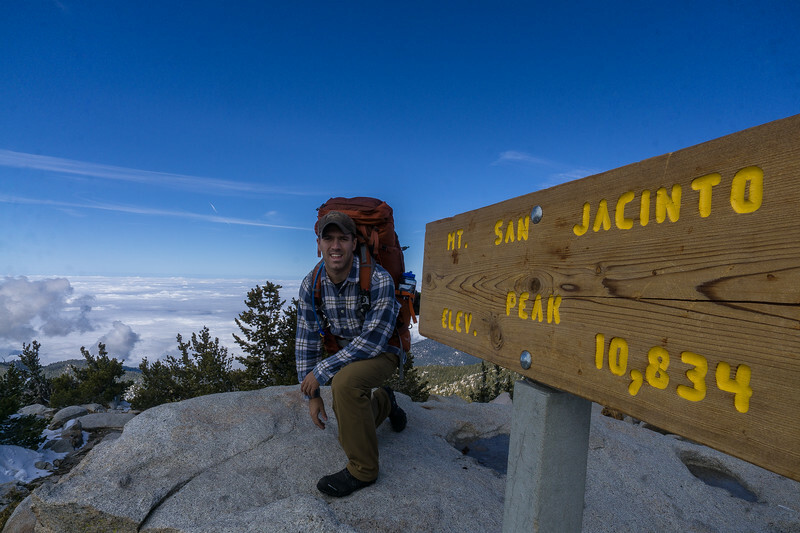 I decided to camp partway up San Jacinto and break the hike up. There was some bad weather and I thought the bad weather in Southern California would make it easy to obtain a permit, but I was wrong. I had planned to camp at Little Round Valley but it was full, the only campground that had free space was Strawberry Junction. Instead of taking Marion Mountain Trail, I settled on Deer Springs Trail. 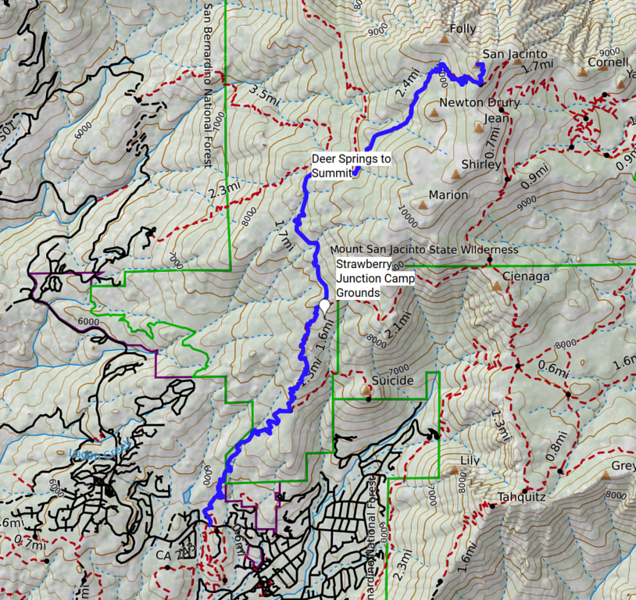 If you would like, you can download my Deer Springs Trail map on Caltopo here. 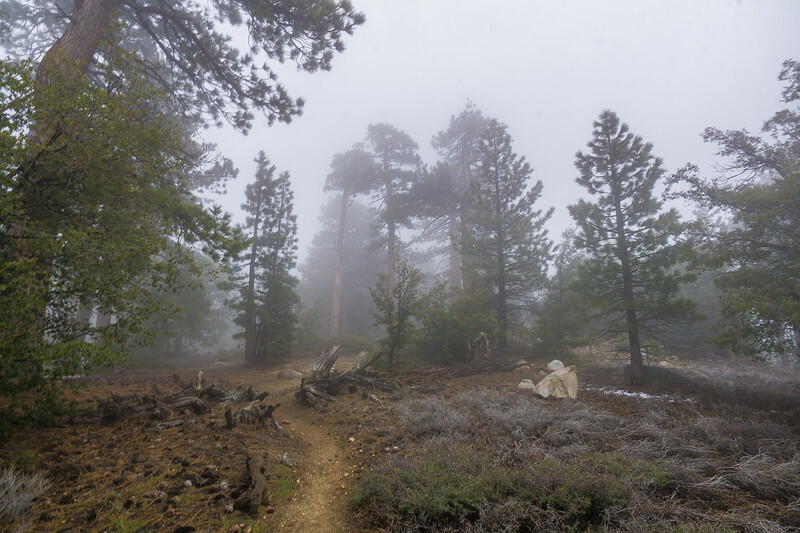 As I headed up Deer Springs Trail I had no idea what kind of adventure I was getting myself into. I had my pack on my back and a whole lot of climbing ahead of me. I started off at 3:08 pm, making two stops for 5 minutes on the way up to Strawberry Campground. Those two stops were for resting, but I made many more quick stops to snap some pictures along the way. The entire way up I could see the bad weather moving in, you couldn’t even see the peak. Just grey clouds surrounding the entire mountain. 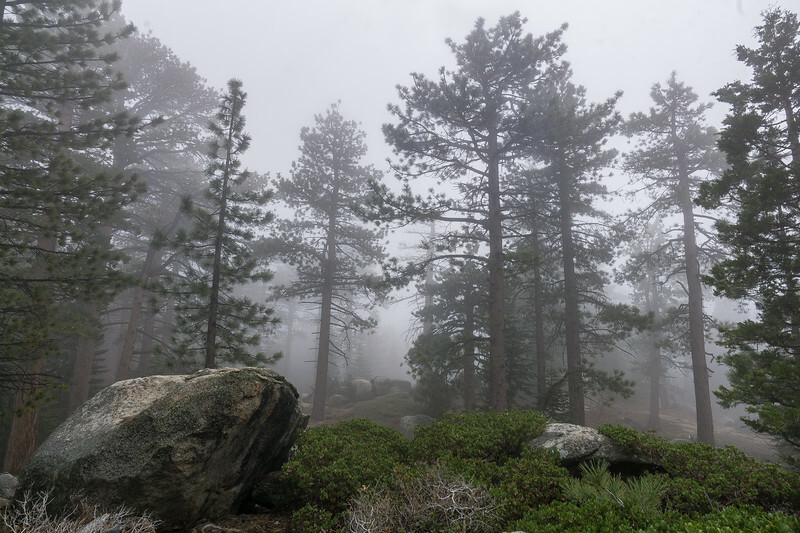 Having grown up on the east coast and now living in Southern California, I have missed forests. One thing I really enjoyed about this hike was being back in the woods and not in a desert. The desert is beautiful in its own right, but there is something I just love about being in the woods, it's just a little more alive. This forest was a bit different compared to the ones I was used to back home in New Jersey. 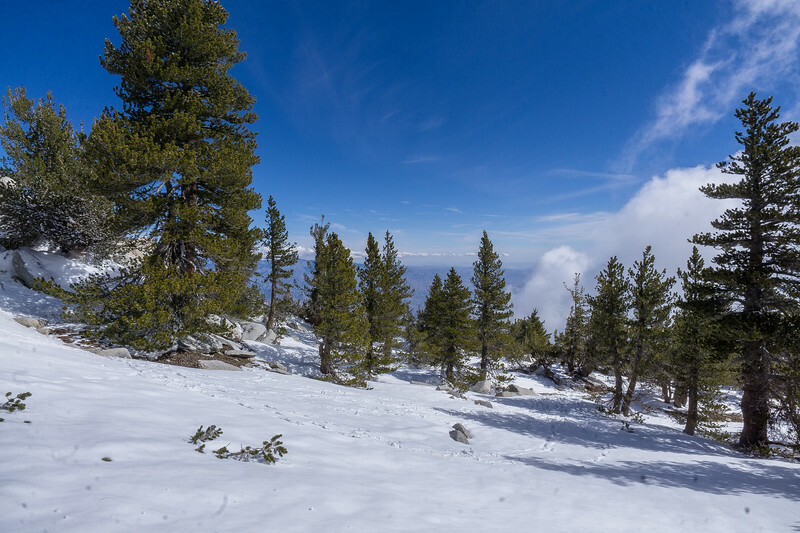 When I originally talked to the rangers while getting my permits, they warned me about the snow above 9,000ft. 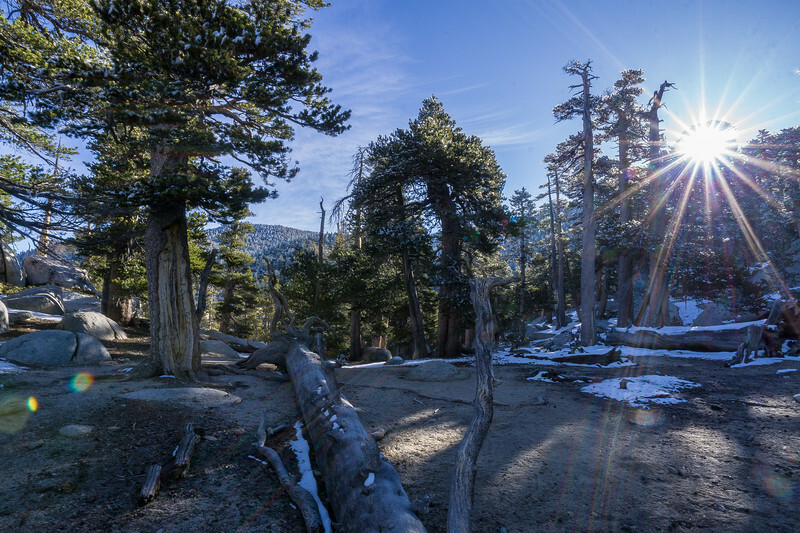 They had some hikers who came down Saturday afternoon, who had camped at Little Round Valley. 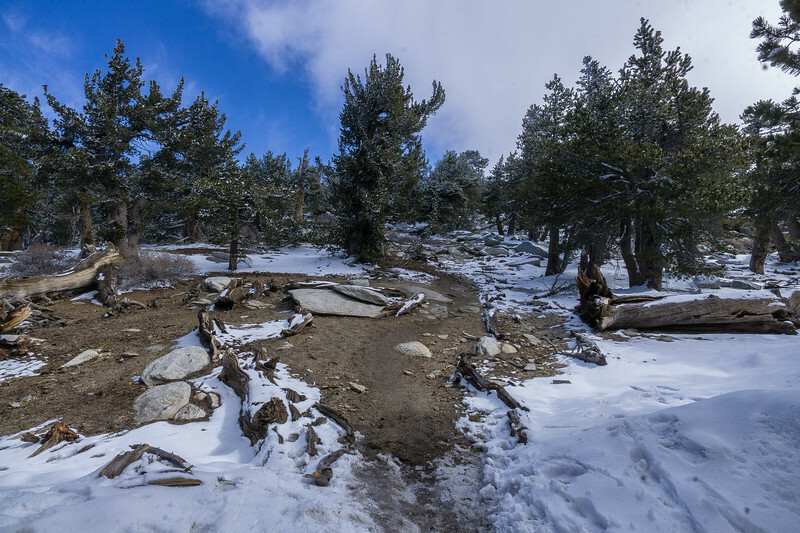 Those hikers reported they couldn’t open the door to the outhouse due to all the snow. 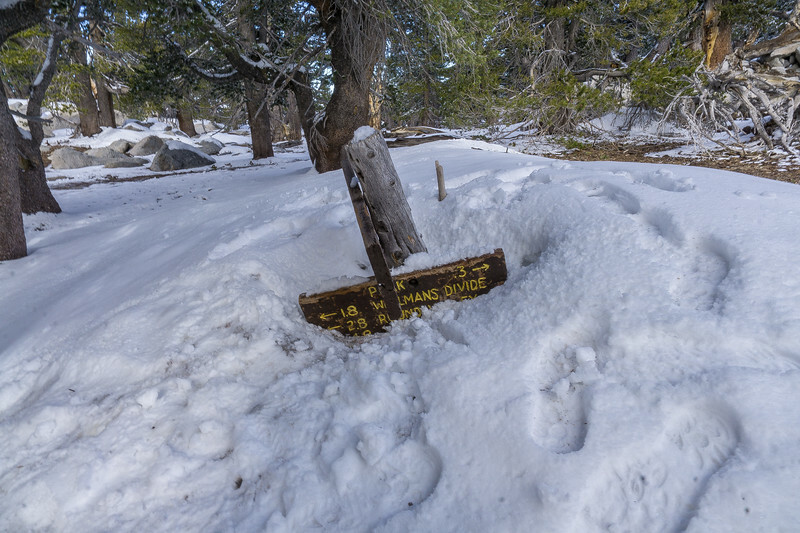 The ranger warned me that the summit received a good three inches the day prior, which honestly made me excited because I hadn’t really seen snow this year. 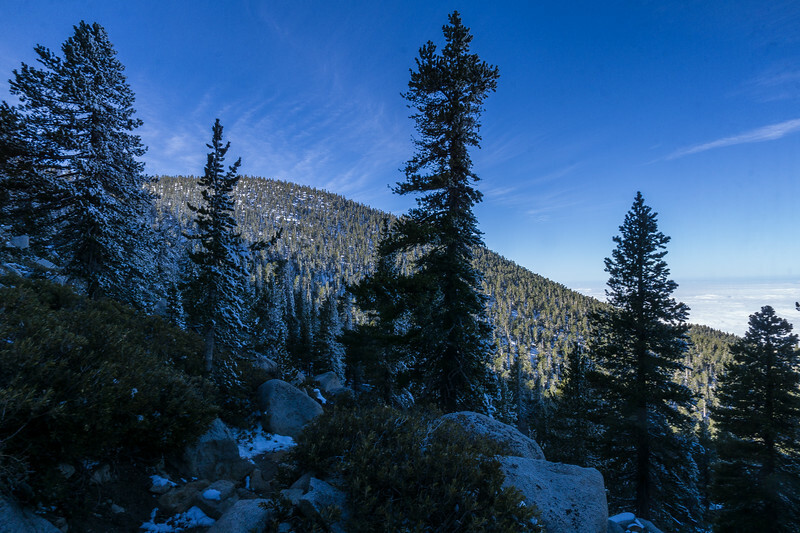 On the way up to Strawberry Junction Campground, there were very little signs of snow. 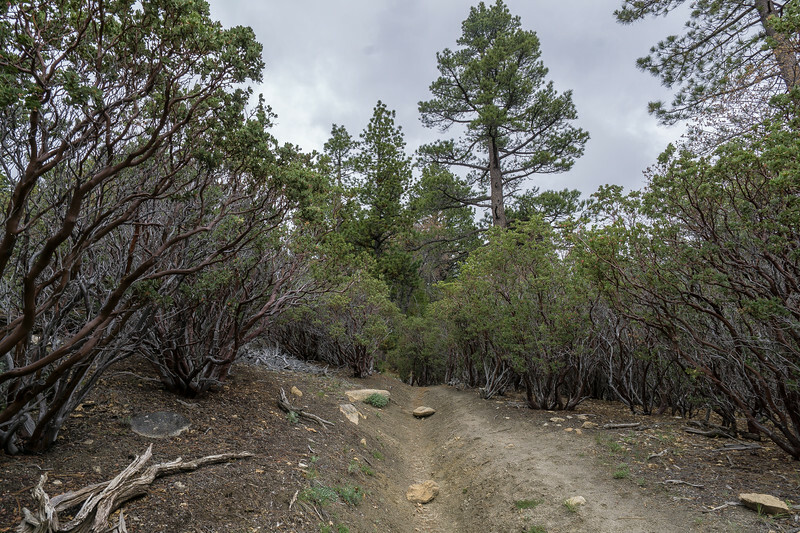 There were a few patches here in there in some shady areas, but for the most part, it looked like below 9,000ft they just got rain. 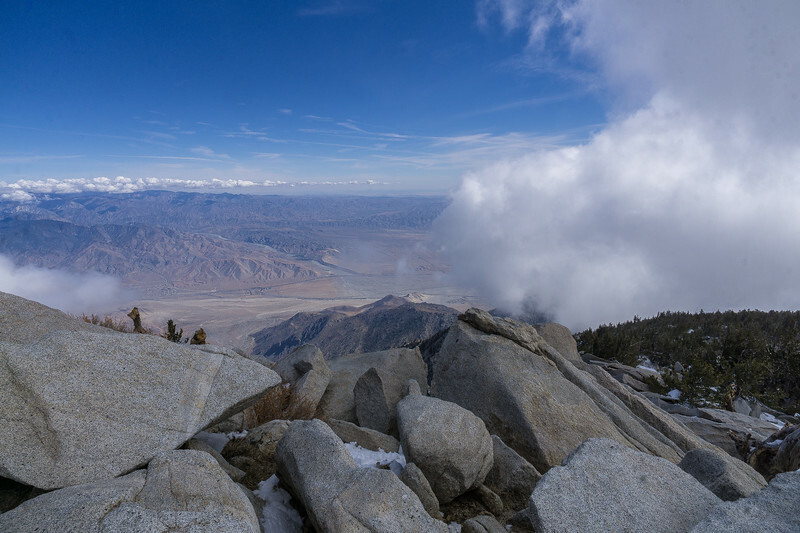 The higher and higher that I climbed, it seemed that I hiked straight up and into the storm cloud that was beginning to overtake Mt San Jacinto. 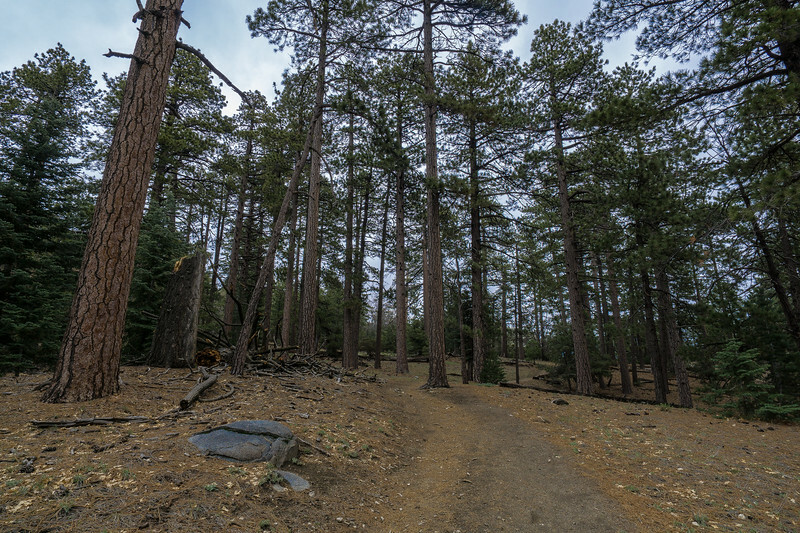 At about 5:30 pm and a little over 2 hours of hiking, I reached Strawberry Junction Campground situated at around 8,000ft. Having a quick peek around before setting in my own campsite, it didn’t look like anyone else was at Strawberry Junction. I found this odd because the rangers told me I got the last spot there, but I guess the bad weather had driven some people away. 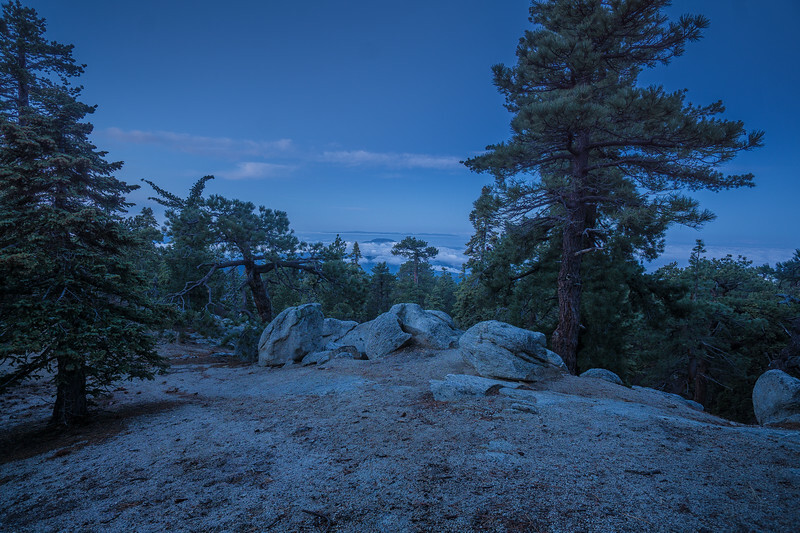 As night began to settle in, I sat down in my camping chair to get off my feet while I boiled some water for dinner. It was at this moment, that I realized I forgot my spoon… I looked around for some good sticks to carve into a spoon but ended up settling on using the plastic top to my pocket rocket MSR stove. I was hungry and it worked just fine. I got to bed pretty early, it was kind of crummy out and my warm sleeping bag was calling my name. I also knew I had a long day tomorrow with summiting and coming all the way back down. I thought it was going to be a super cold night up at 8,000ft so I had an insulating bag on standby in my tent just in case I got too cold. I used a Thermarest sleeping pad and my bag is rated to 15 degrees, so I never really got cold at all in the middle of the night. I was actually pretty warm… but it did get cold outside of my tent. 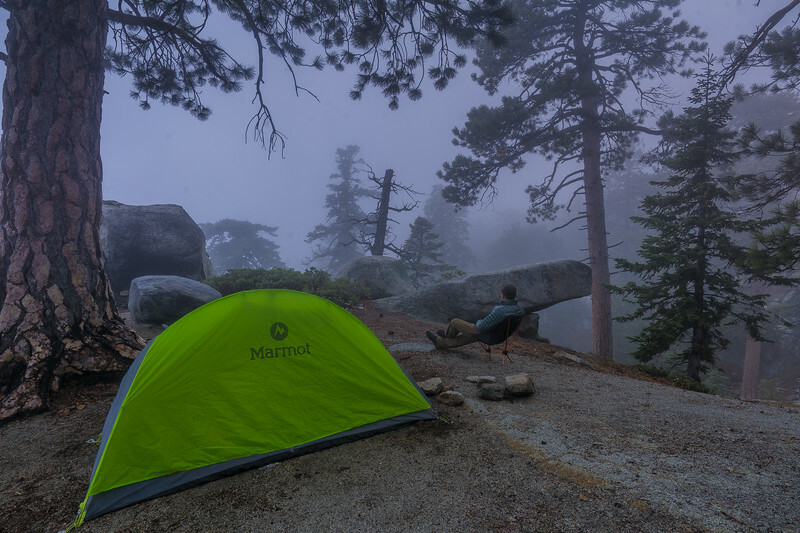 It rain/iced most of the night, but my new EOS 1p Marmot tent, held up great, I stayed dry and warm and had no issues. I also recently purchased the Sea to Summit Aeros Premium pillow. I will have a full review eventually on here, but the quick version is, I absolutely love it! 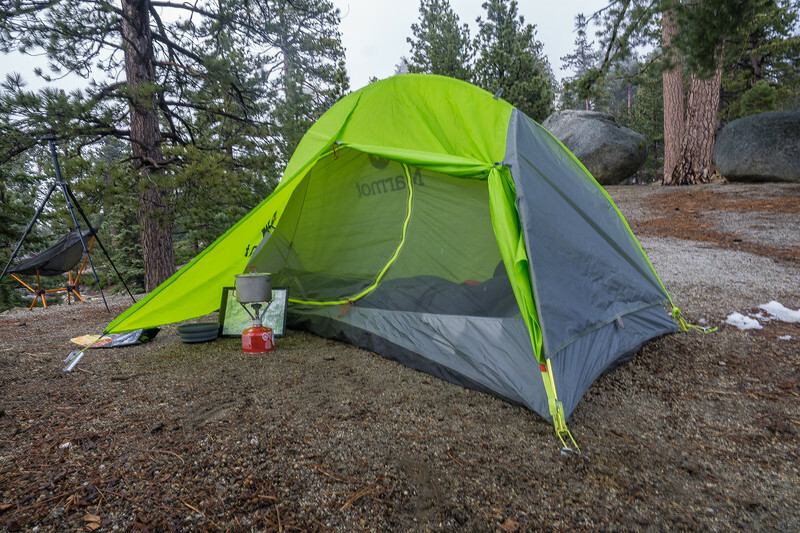 In the morning, when I woke up my rain fly was covered with a thin sheet of ice. Still shocked I stayed completely warm throughout the night inside. I was also glad to see I didn’t wake up inside a cloud, and it actually looked like it was clearing up a bit. 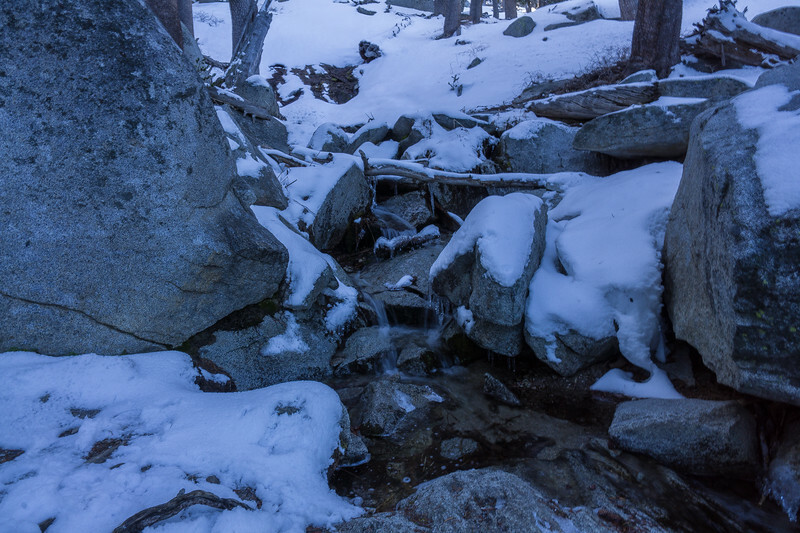 In the morning, I decided to skip breakfast because I wanted to get back on the trail as soon as possible. I knew it was going to be a long hike up to the summit. I packed my things and got on the trail around 6:00 am. The higher I climbed the more snow I began to see. It may have rained/iced on me at 8,000ft but it definitely snowed up in the higher elevations. 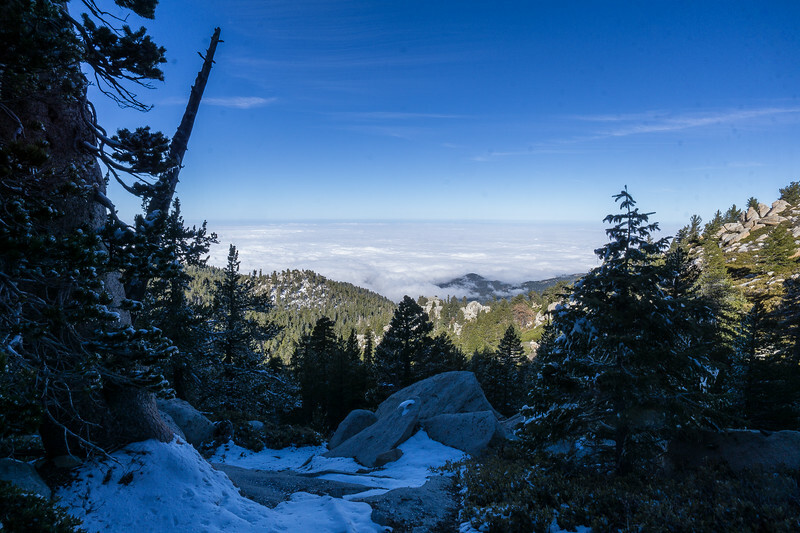 Not only did the snow build up the higher and higher that I climbed, but so did the stunning views of down below. With the the massive cloud that was overtaking the mountain yesterday cleared, I was finally being treated to some beautiful views. After almost 3 hours of constantly climbing, my quads were burning and I was getting pretty tired. I eventually ran into this sign buried in the snow. If you cant read that yourself it says, “Peak .3” miles! 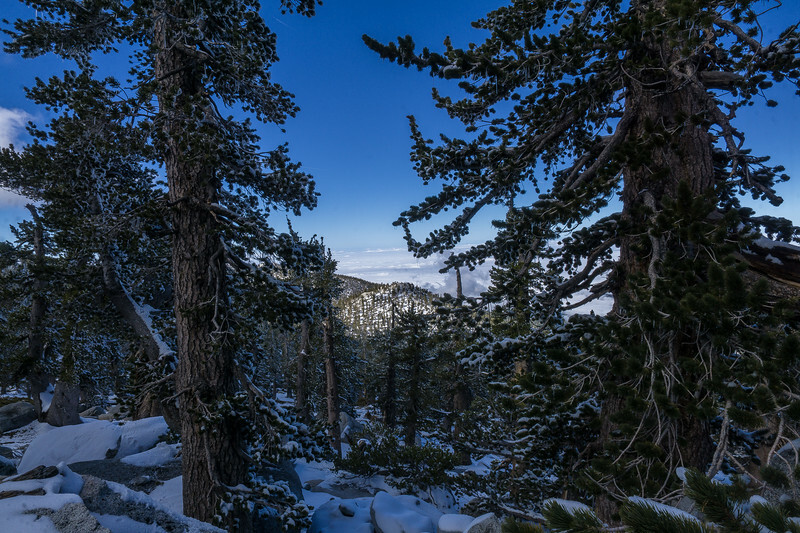 At last, I was just about at the top of Mount San Jacinto! Little did I know that was going to be the longest .3 miles ever! At this point, I was pretty spent, and seeing this sign got me stoked! It gave me that burst of energy no caffeine or food on the trail could ever give you. Unfortunately, it was short lived. The last .3 is a bit of a scramble over large boulders if you are a Civil War buff, I basically had to climb over Devils Den to reach the summit. 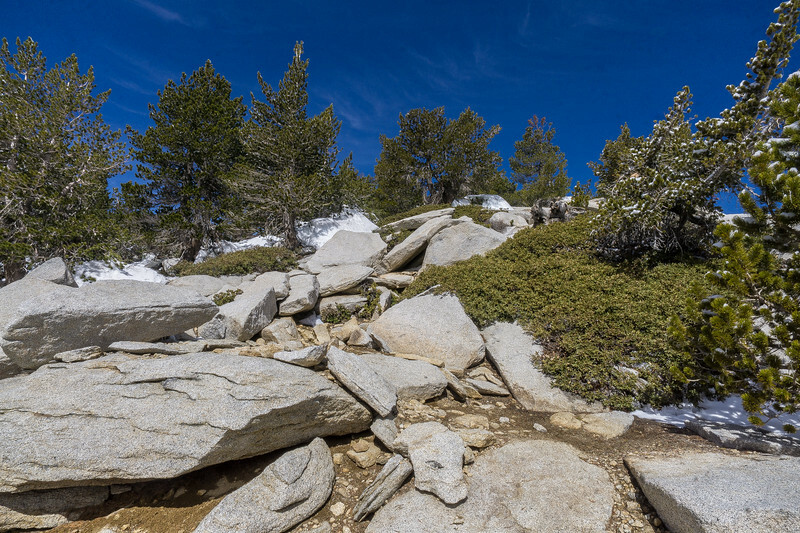 This scramble was made a little more complicated due to the boulders also being covered in snow. Thankfully I did not fall or roll any ankles. I climbed up and over and then I saw the sign that marked the top! 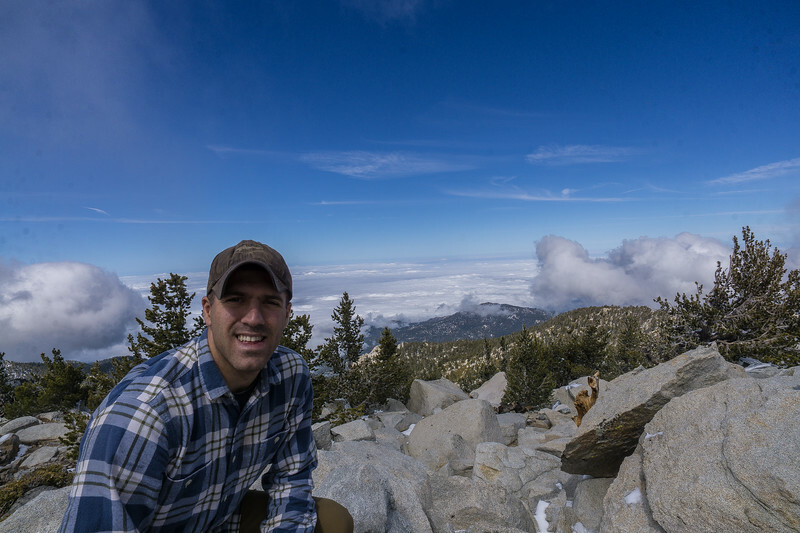 I was finally there, and made it to the top of Mount San Jacinto! After a quick break, some snacks, and pictures, it was time to make the long haul back down the Mountain. It was in fact mothers day, and I had to make it to the bottom in time to call my mom before it got to late back on the east coast.